, an English divine of popular fame in the sixteenth century, was born in 1550 of a good family at Withcock in Leicestershire, and after purstuing his studies at Oxford, entered into the church. Wood thinks he took the degree of M. A. as a member of Hart-hall, in 1583; and adds, that “he was then esteemed the miracle and wonder of his age, for his prodigious memory, and for his fluent, eloquent, and practical way of preaching.” His scruples, however, as to subscription and ceremonies were such, that being loth, as his biographer Fuller informs us, “to make a rent either in his own conscience or in the church,” he resolved not to undertake a pastoral charge, but accepted the office of lecturer of the church | of St. Clement Danes, London. Here he was patronized by William Cecil, lord Burleigh, to whom he dedicated his sermons, and who prevented the prosecutions to which the other scrupulous puritans were at that time exposed. He appears to have been one of the most popular preachers of his age. 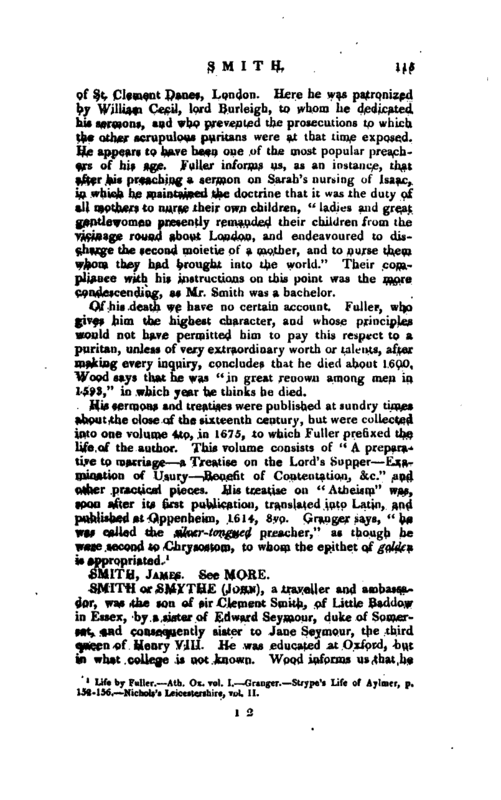 Fuller informs us, as an instance, that after his preaching a sermon on Sarah’s nursing of Isaac, in which he maintained the doctrine that it was the duty of all mothers to nurse their own children, “ladies and great gentlewomen presently remanded their children from the vicinage round about London, and endeavoured to discharge the second moietie of a mother, and to nurse them, whom they had brought into the world.” Their compliance with his instructions on this point was the more condescending 1 as Mr. Smith was a bachelor. Of his death we have no certain account. Fuller, who gives him the highest character, and whose principles would not have permitted him to pay this respect to a puritan, unless of very extraordinary worth or talents, after making every inquiry, concludes that he died about 1600. 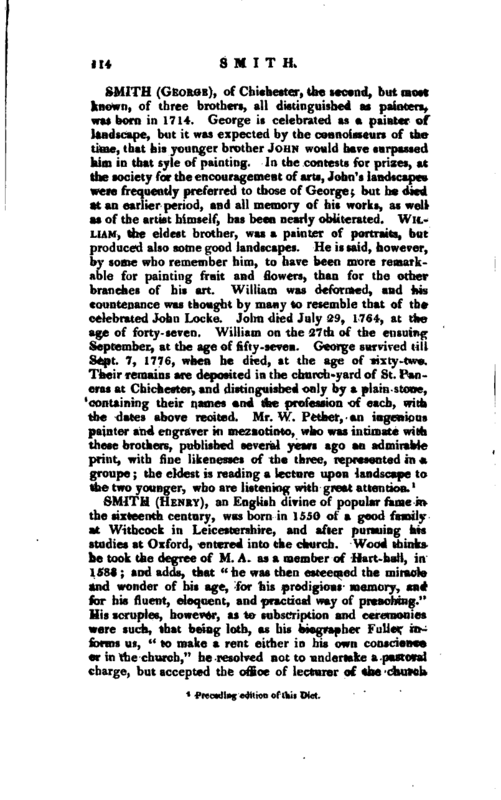 Wood says that he was “in great renown among men in 1593,” in which year he thinks he died. 1 Life by Fuller. —Ath. Ox. vol. I. Granger. —Strype’s Life of Aylmer, p. 15-2-156. Nicholas Leicestershire, vol. II.